Introduces intermediate-level students to a wide range of authors and encourages them to develop their English by reading for pleasure. 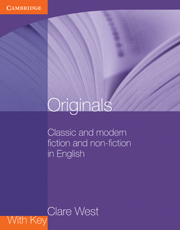 Originals introduces intermediate-level students to a wide range of authors and encourages them to develop their English by reading for pleasure. 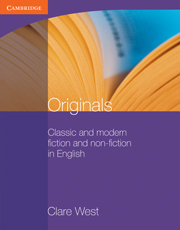 The book contains extracts from classic and modern fiction and non-fiction, written in English by authors from many different countries. There are extracts from classic novels and short stories, spy and ghost stories, thrillers, war, fantasy novels, a biography and contemporary fiction. The texts has been carefully selected for the level so that intermediate students, and those preparing for the Cambridge Preliminary English Test (PET), will be able to understand them with the help of the notes and exercises.